I enjoy photographing elopements in New Orleans, as they provide the opportunity to work with the couple in a relaxed manner to capture memorable images such as this one. This gorgeous picture was captured just a few minutes after sunrise on a perfect October morning. 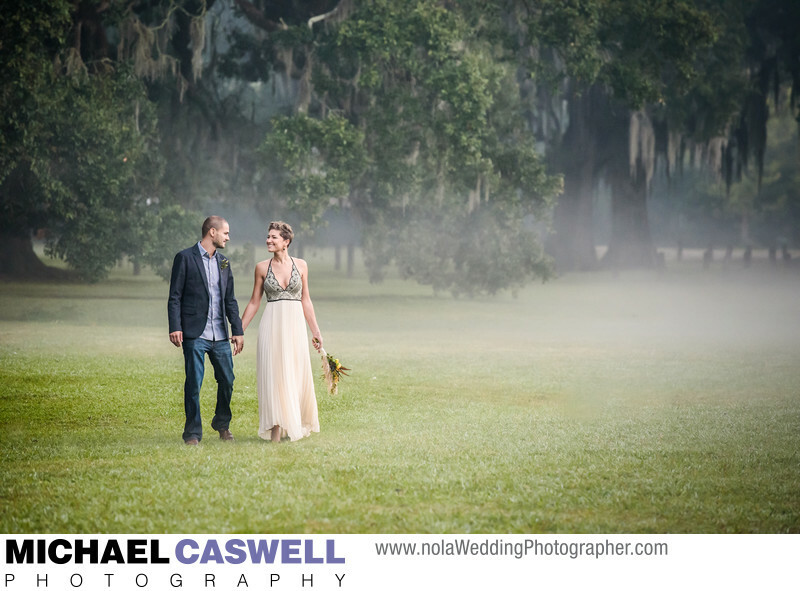 The couple was eloping to New Orleans, and wanted an early morning portrait session at the majestic Tree of Life in Audubon Park, so we began shooting right at the crack of dawn, literally! It was still dark when I arrived to get set up! The perfectly soft light was wonderful to work with, and the misty fog that covered the ground was breathtakingly beautiful. Had we started just an hour or so later, though the light still would have been pretty good, we would not have had that amazing looking mist over the grass. Another benefit to such an early session was that we virtually had the area to ourselves. Another photographer showed up briefly to grab a few landscape shots of the scenery, and toward the end of the session a jogger or two ran by, but in general we were able to shoot wherever we wanted without having to worry about framing out unwanted people in the background. In this series of shots, I asked the couple to just walk across the grass, holding hands and chatting, and pretending like I was not there. I love these kinds of photographs when shooting engagement portraits or couples on their wedding day, as the relaxed facial expressions and body language capturing in these relatively unposed pictures makes for a much more natural appearance. Location: Tree of Life, New Orleans, LA.